"We the People, in order to form a more perfect Union . . ." The first words of the U.S. Constitution seem obvious to us today, but compare them with the equivalent phrase in the Articles of Confederation, which served as the nation's first constitution in the 1780s. In that document the thirteen states, not "the people," agreed to "enter in a firm league of friendship with each other." It became painfully evident, as we know, that a "league of friendship" was insufficient binding tape for the nation. How the citizens of the new republic created a constitution that would truly secure the blessings of liberty is the focus of this Theme. 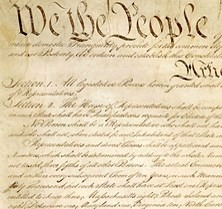 Block Image: Constitution of the United States, signed copy, 1787, p. 1 (detail). U.S. National Archives, Miscellaneous Papers of the Continental Congress, 1774-1789; Records of the Continental and Confederation Congresses and the Constitutional Convention, 1774-1789, Record Group 360. Courtesy of the U.S. National Archives and Records Administration.